The ScopeCheck FB DZ product line offers compact devices with large measuring ranges. A large combined measurement range can be achieved for Multisensor measurements, as for the smallest machine it is 425 mm x 500 mm x 350 mm with an image processing sensor and a conventional probe. For measurements with only one sensor, the smallest machine offers an expanded measuring range of up to 530mm x 500 mm x 350 mm. Larger measuring ranges are for example 1130 mm x 650 mm x 350 mm in size. The design of the new ScopeCheck FB DZ version is much more compact. 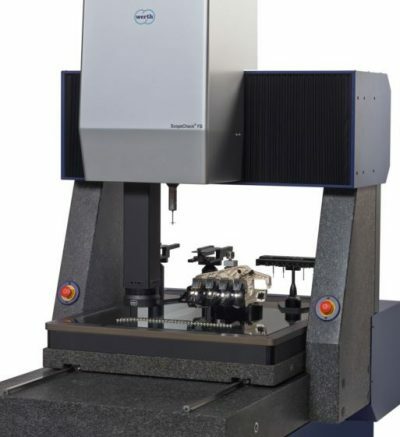 As compared to the previous model, the machine is height wise 130 mm lower and lengthwise 250 mm shorter, while still covering the same measurement range. Even though the new machine weight has been reduced by approx. 400 kg, it is sturdier, and the ambient vibration responsiveness is much improved. The ScopeCheck FB DZ can be loaded from all four sides, and the accessibility is improved even more with the extendable measuring table. With the new transmitted light concept, the glass table and transmitted light unit are easy to disassemble for the measurement of heavy work pieces, and the work pieces can be mounted directly on the measurement table. The machine can optionally be equipped with two independent sensor axes. Both optical and tactile measurements as well as an optimal combination of both measurement principles are possible. During measurements with one sensor, the second axis remains in the park position outside of the measuring range. This ensures that the geometries of the work piece can be accessed from all sides without the risk of collision. In combination with the thin probing ram, this allows for lowering of the sensor into a large work piece. If the machine is only equipped with one sensor axis, the second axis can be added later onsite if found to be necessary. With the Werth Multisensor System, a wide variety of sensors can be attached to each sensor axis. These sensors are attached with a magnet coupling without offsetting the sensors at the same position in front of the beam path of the image processing sensor. To be able to automatically set up different sensors, the retracting axis for changing racks is now also available for the ScopeCheck FB DZ. The changing rack is only moved from its park position into the measuring range via the coordinate measuring machine axes when the sensors are being changed. After the change it returns to its park position outside of the measuring range. The benefit here is that the entire measurement range may be used to measure work pieces.